A fateful summer day which dawned sunny and crisp and crystal clear. Struggling upward step-by-step, alone in my cocoon with my onerous burden, isolated from the crowds joining me on the pilgrimage up the Muir Snowfield on Mount Rainier. Bearing the tools for a long-sought ski descent, 42 lbs of alpine skis and boots and gear and dreams. Onward and upward, heavier and slower, hour after hour, step after step after step. The tantalizing goal of Camp Muir at long last becoming visible, inching ever so slowly within my grasp, and finally attained after 6 hours of sweat and toil. A much-needed rest in the thin air and endless views, the hours growing lazy and late. Then onto the skis for the swift descent, free and fast. The unsteady balance of skiing with a pack for the first time, tentative at first but soon perfected. The swift hiss of sharp skis carving sinuous arcs down an endless slope of perfect smooth corn snow. Skiing and volcanoes and glaciers, wind and fire and ice. The essence of the Cascade Range, a sublime marriage of disparate elements, the fusion of hot and cold, sun and snow, fast and slow, the alpha and omega experienced while gliding on the razor�s edge. My first backcountry ski experience, a lifetime of lift-served yo-yoing traded for a single shining run, a dream realized and a life changed forever. I had been reborn. Text above was originally written in 2000, revised and edited now. 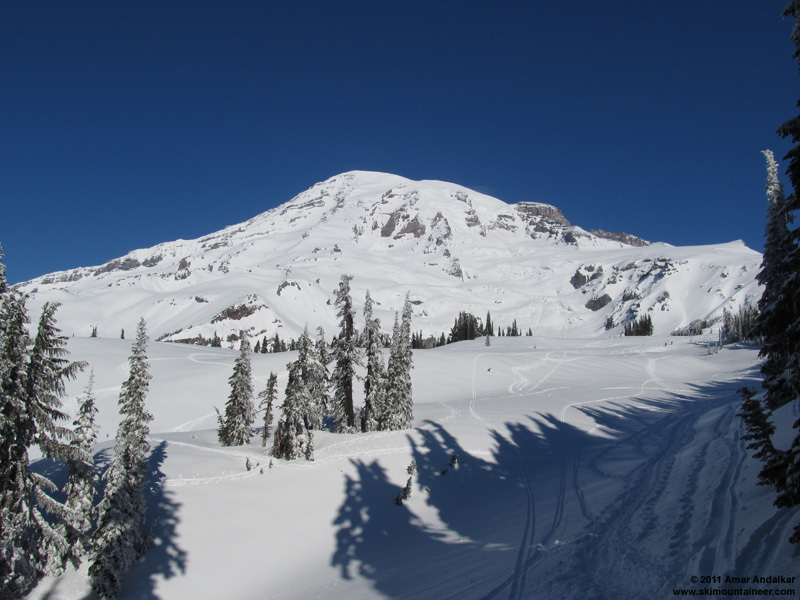 Paradise Weather Data for June 29, 1996: high 55 �F, low 32 �F, snow depth 42"
Almost fifteen years, and really a second lifetime too, have passed since my epiphany, my rebirth on the Muir Snowfield that day. Five more years of grad school to complete my PhD, then nearly six years as a member of the research faculty in the UW Physics Department, and now several years of freedom and chasing my dreams, trying to complete my guidebook and sort out my course in life. My website skimountaineer.com first launching way back in November 1997, the idea to write a guidebook to Skiing the Cascade Volcanoes germinating back in June 1999. 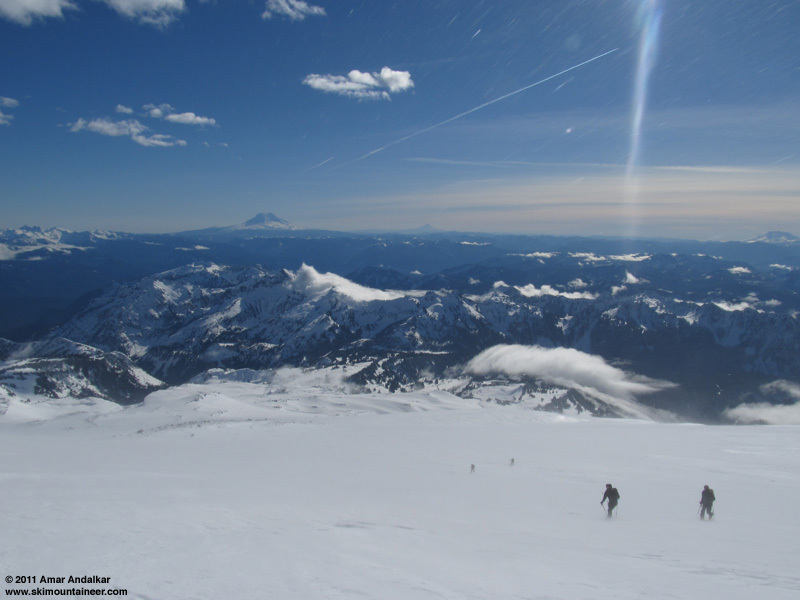 Over 470 days and nearly 2 million vertical ft of backcountry skiing since that first day at Muir, including well over 100 volcano summits on over 30 different volcanoes. And now so much happening in the last week alone, my previous trip to Muir (February 1, 2011, More Muir Sunshine) on the same day that my friend Monika fell from atop Red Mountain. So much sadness and bonding and deep emotions since then, culminating with a profound trip to retrieve her gear from the summit only three days ago (February 7, 2011, Red Mountain, Remembering Monika). How strange that Red Mountain was also the first mountain I had ever climbed, on June 16, 1996, only two weeks before my first trip to Muir: a training climb with my grad school classmate and mentor and friend, Alex Cronin (now a physics professor at U of Arizona), practicing roped travel and placing pro up the snow-filled gullies on the west side above Red Pond, then glissading down another gully on the south side and rappelling over a pair of wet cliff bands. Now I was exhausted and drained and numb from all that had happened, but the forecast called for two days of sunny warm weather on Wednesday-Thursday February 9-10, followed by a long-awaited switch to a much wetter and colder weather pattern. I had to ski. Muir was the tentative plan for Wednesday, but a morning glance at the Muir telemetry showing winds over 50 mph led me to change plans last-minute, heading to Crystal to yo-yo the gondola all day instead. So on Thursday I awoke even more tired, but the telemetry now showed winds under 20 mph, so off to Muir it was. 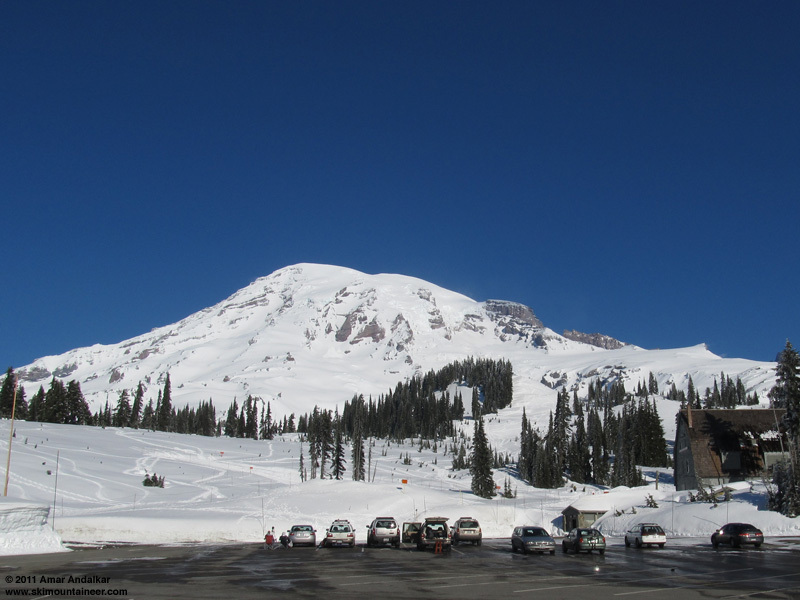 I knew that it would be my 100th time skiing from Camp Muir, if I made it up there this time. I had tried to find partners for this day (no luck), but it was somehow quite fitting that I was alone again, as almost exactly half of my Muir trips have been solo. I cried on and off during the drive to Rainier, just as I had the day before while driving to Crystal, my emotions over the past week's events still not fully controllable whenever a sudden wave of feelings would hit me. I started my slow, steady, tired ascent from Paradise a little after 10am, just after a large caravan of 16 police cruisers and SUVs had arrived in the parking lot (Pierce County Sheriff and Tacoma Police, doing snow search and rescue practice). It was almost the same time as I had left Paradise on my first trip in 1996. Very calm and quiet at first, no wind and no people either. 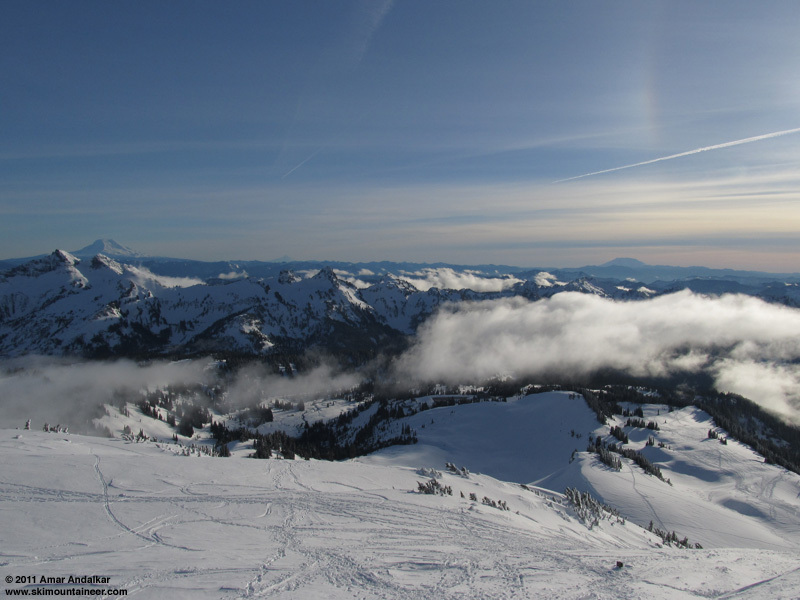 Surprisingly the 6-8" of new snow from 2 days earlier was still light and powdery in the meadows above Paradise, unaffected at all by the previous day's sunshine. Topping Panorama Point on a nice easy skin track, I caught up to two groups of two skinning uphill. After exchanging chit-chat and names, we formed a loose association of five, taking turns breaking trail up the Snowfield in the glorious weather, sunny with just a minimal breeze and a few puffy clouds casting shadows sweeping across the snow. Breaking trail up the Muir Snowfield before the winds hit. Our loosely connected group skinning up. An incipient lenticular cloud had formed over the summit by 11am when I'd reached the flats below Pan Face, and it continued to grow as we ascended. 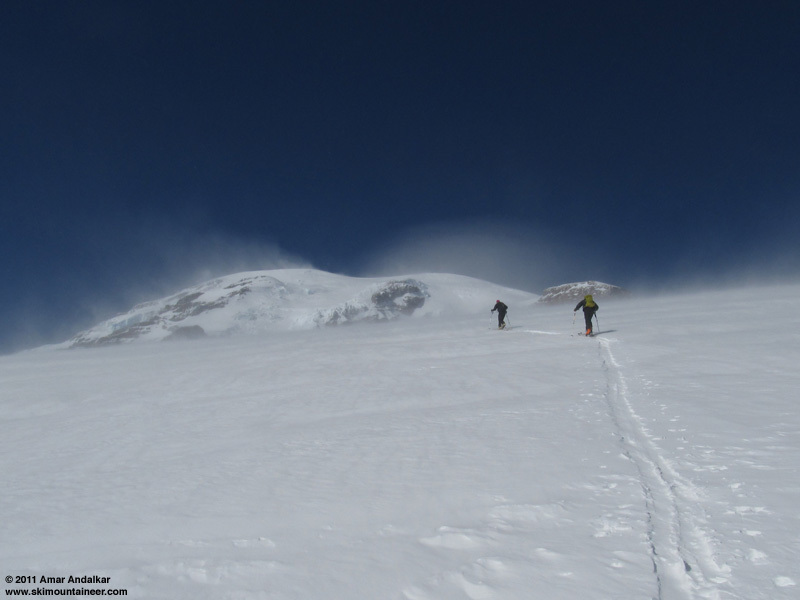 Then the winds hit us: at first an occasional snow devil whirling down the Snowfield, then an increasingly strong and gusty NNW wind above 8000 ft, flowing over the summit of Rainier and then pouring downslope towards us. We all added more and more clothing to cope, but by 9000 ft the downhill headwind had reached 30-40 mph, with occasional gusts near 50 mph that upset our balance on the increasingly firm and icy snow surface. Skinning up into high winds above 8500 ft.
Progress was slowed to a crawl by the snowy blasts of wind, which magnified the difficulty in maintaining grip on the iciest patches. I added ski crampons at 9300 ft, and continued up alone, as the others turned around at that point. I might have turned around too, had this not been potentially my 100th ski from Muir. Skies were clear overhead and temps were still warm in the 20s, but all around us was a ground blizzard, with blowing snow obscuring visibility at times. Looking down from near 9300 ft, with snow blowing overhead and all around the others skinning up. 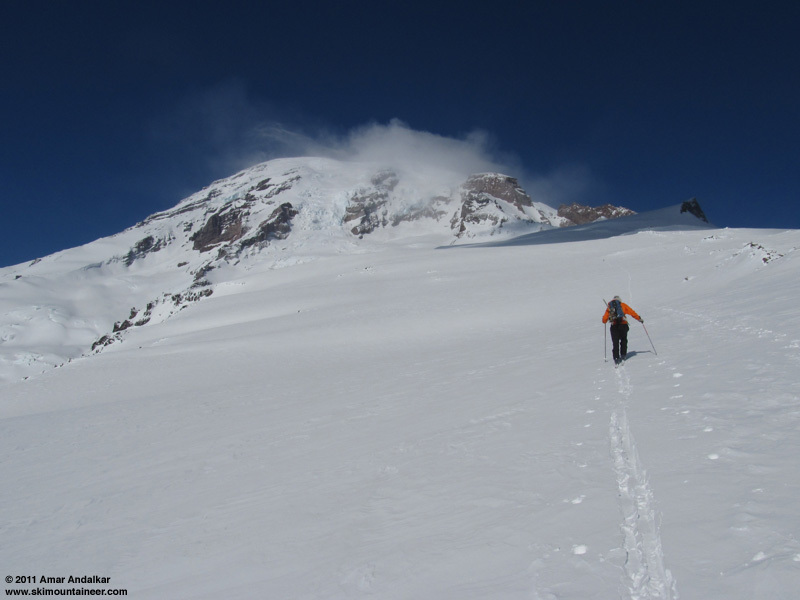 I realized that some strategy would be needed in order to even reach Camp Muir under such conditions. I decided to head NW, straight up into the teeth of the wind towards the 9800 ft toe of Cowlitz Cleaver, to try to quickly gain the comparative wind shadow of the steep headwall there at the top of the Snowfield. Eventually it worked, I moved into the shelter of the Cleaver with only an occasional blast mixing downwards, and even skinned across numerous drifts of loose wind-deposited snow, some up to a foot deep. From here, it was an angling traverse NE to reach Camp Muir, an unusual route variation that I'd never taken before. Approaching Muir from a new direction. I arrived at 2:30pm, the battle with the wind and the long detour west having cost about an hour of time. A large RMI group was just returning from the summit via Ingraham Direct, with two rope teams led by Seth Waterfall and other guides. They had left in near-calm conditions in the early AM (just as seen on telemetry), but winds had picked up by the time they summited, and were blasting them from behind during much of the descent. After a brief chat, I skinned over to the public shelter and huddled inside out of the wind. A skier and boarder were packing up and preparing to descend, they had summited on foot via Gib Ledges. As we chatted inside the hut, it seemed that the winds outside were decreasing quickly. By the time we skied down after 3pm, there was only a moderate breeze left at Muir, while low clouds were forming in the valleys below and obscuring the view down to the Paradise area. Mounts Adams, Hood, and St Helens from Camp Muir, with Paradise obscured by building clouds. The skier and boarder I met at the Muir hut. Snow conditions were quite mixed as expected after the sudden windstorm, but they weren't too bad. Skiing down along pillows of wind-deposited snow provided nice turns in dense powder, with a few icy areas needing to be crossed to connect the pillows. Almost miraculously, the wind lower down on the Snowfield had entirely subsided to calm by 9000 ft, and the only breeze was that generated by our own motion downhill. Amazing what a difference that a half-hour break made in the ski conditions and the enjoyment of the run. It felt as though the strong headwinds and ground blizzard had been a test of my will to reach Muir yet again, and the calm conditions and freshly deposited powder drifts were a reward for passing that test. Below 8500 ft, there was no more ice, but there were a few areas of breakable windcrust which required caution. Otherwise snow conditions were fairly good on windpacked powder down to the Pebble Creek area. Even along the ridge back to Pan Point, the snow was still OK, although the steep south-facing rolls had been significantly sun-affected by now. Pan Face was in good condition, despite innumerable small natural rollers which tracked up the snow, it still skied very nicely, soft and easy to carve in the afternoon sun. The clouds down here had mostly dissipated, keeping the run in the sunshine the whole way. A quick cruise down the snowy meadows, which was best on sunny aspects while avoiding the incipient crust in shady areas, brought me back to Paradise by 4pm. 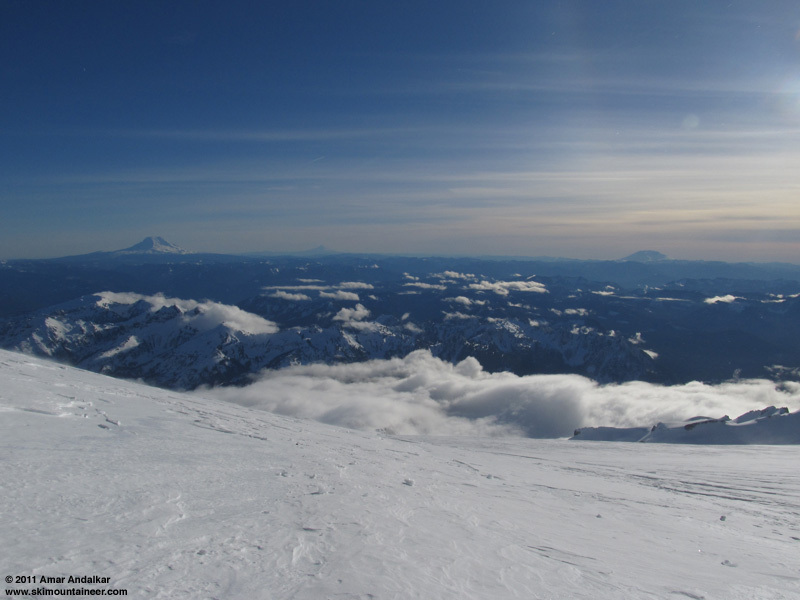 I recalled with a smile that on my first trip in 1996, I hadn't even reached Camp Muir until after 4pm. View from atop Pan Point, with a segment of the 22-degree solar halo (or sundog) at upper right. What can I say about the Muir Snowfield, named for one of the greatest heroes of the environmental movement, John Muir. And really misnamed, for the "Snowfield" is actually a glacier, with a core of blue glacial ice beneath the surface snow, and often sporting a number of open crevasses by late summer. When integrated over a full year, I think that it's the single best ski route in the Cascades (and therefore in the lower 48 states, at least). No other route can match its combination of stunning scenery, easy accessibility, large vertical, and length of season, with skiable snow of some sort available year-round. 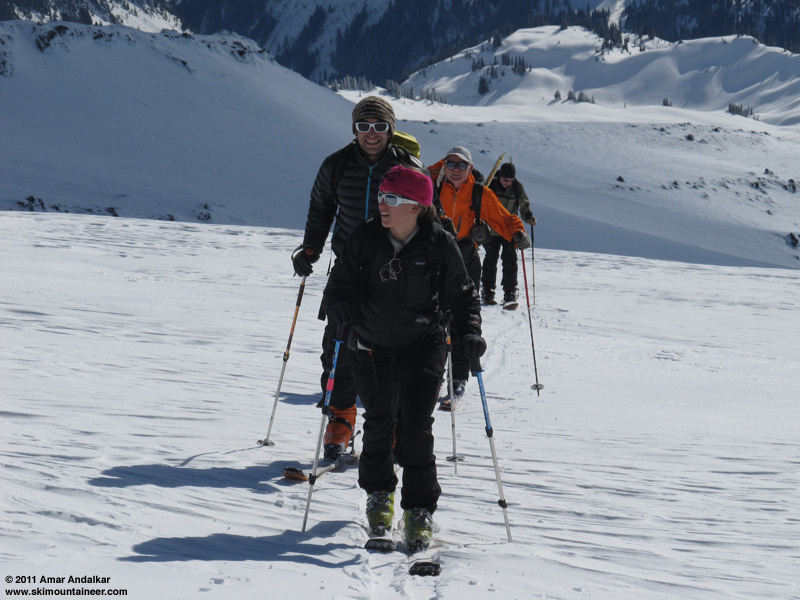 Most importantly, it's an egalitarian route, skiable safely by almost any skier willing to learn the most basic backcountry skills, not restricted to the athletic and highly-skilled like other more serious routes which are often nominated as "best". In fair weather (and only in such), it's an ideal training ground for introducing newcomers to our sport (assuming they have adequate fitness of course). 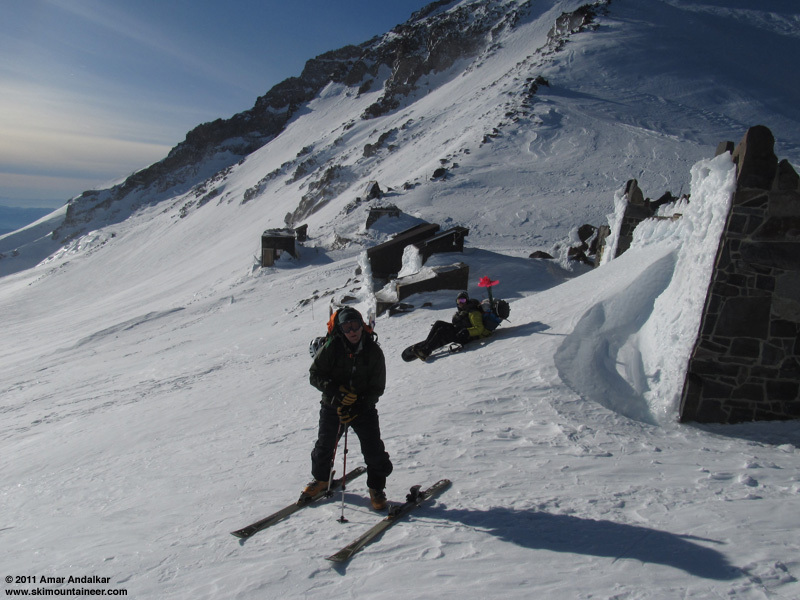 Over the years since 1996, I've taken a number of newbies up to Camp Muir for their first backcountry turns and first summer turns, on alpine skis, alpine trekkers, AT, snowboards, and splitboards. I've skied from Camp Muir in all seasons, at least 3 times in every month of the year, in every snow condition from best to worst. From blower powder to ball-bearing graupel-powder to firm windpacked powder, on perfect smooth corn snow and crinkling firnspiegel and oversoftened mush, on the icy trap-crust of sunset which makes turning impossible, on windblown ridges of sastrugi and icy fins of water ice, on bare frozen rain crust like a skating rink in January and bare blue glacial ice studded with dirt and rocks in September. 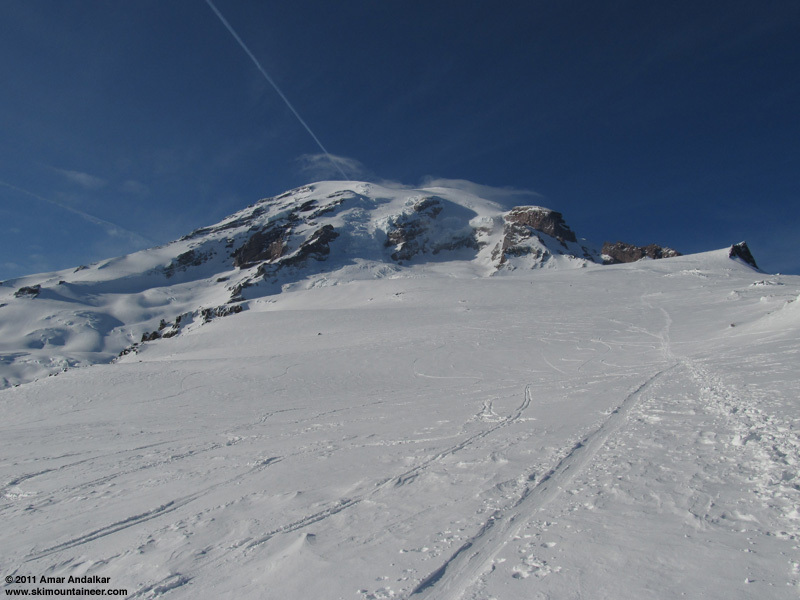 I've also skied from Camp Muir by several different routes other than the Muir Snowfield alone, with Cowlitz Glacier, Paradise Glacier, and Nisqually Chute being the main alternate routes, along with a number of variations. Many people disparage the Muir Snowfield for whatever reason (too flat, too boring, too crowded, their own arrogance, etc). But I've always been sold on its charms, and it will always hold a cherished place in my heart. It's the temple where I found my religion, 15 years ago that day. Those same people may also disparage 100 ski descents from Muir as being nothing much of significance, and they may have a point, it's not that important. But it's a significant milestone in my life, and I felt like sharing the story (and the backstory) with you all. I'm certainly looking forward to my next 100 ski descents from Muir over the upcoming years, and perhaps sharing the experience of this special place on a special Mountain with more of you! Histogram of my trips to Camp Muir: ski trips in blue, on foot in gray. This was my 104th ascent to Muir, but 4 of them were on foot only with no skis, for mid-summer climbs of the DC. Multiple ascents/ski descents of the upper snowfield to Muir on a single day have been counted as only a single trip. Paradise Weather Data for February 10, 2011: high 40 �F, low 22 �F, snow depth 123"
SYNOPSIS...HIGH PRESSURE WILL PROVIDE DRY WEATHER THROUGH TONIGHT. A FRONTAL SYSTEM WILL BRING RAIN LATER FRIDAY AND INTO SATURDAY. A RELATIVELY WET PATTERN WILL CONTINUE INTO NEXT WEEK AS ADDITIONAL FRONTAL SYSTEMS MOVE THROUGH THE AREA. THURSDAY...MOSTLY SUNNY. FREEZING LEVEL 6000 FEET. THURSDAY NIGHT...MOSTLY CLOUDY. FREEZING LEVEL 7000 FEET. FRIDAY...MOSTLY CLOUDY. FREEZING LEVEL 7500 FEET. FRIDAY NIGHT...CLOUDY WITH A CHANCE OF RAIN AND SNOW IN THE EVENING...THEN SNOW AND RAIN LIKELY AFTER MIDNIGHT. SNOW LEVEL 5000 FEET. SATURDAY...SHOWERS. SNOW LEVEL 3000 FEET. SATURDAY NIGHT...SHOWERS. SNOW LEVEL 2500 FEET. SUNDAY...SHOWERS LIKELY. SNOW LEVEL 2000 FEET. SUNDAY NIGHT...CLOUDY WITH A CHANCE OF SHOWERS. SNOW LEVEL 2000 FEET. MONDAY THROUGH TUESDAY...SNOW AND RAIN LIKELY. SNOW LEVEL 3500 FEET. TUESDAY NIGHT AND WEDNESDAY...SHOWERS LIKELY. SNOW LEVEL 2000 FEET. Glad you're hanging in there Amar. Nothing trivial about becoming intimate with a beautiful place. Thanks for sharing what it means to you. Cool, congrats on the 100! Nice write up. I too like to return to old haunts and see them in different conditions/seasons/light. Looking forward to the guide. Enough of this drivel, who's the chick? We stayed below 8,000 and actually got in some really nice powder skiing. Amar , A most appreciated post ! You better than most know the permutations of routes both up and down that wonderful place. 100 tours up there most likely isn't enough to sample it in all it's variety. It was good to see you on your 100th. I think you got the last of the good snow (for now anyway). This morning the wind was averaging 60 with gusts in the high 80's at Muir. Thus the conditions on the snowfield were "windblown ridges of sastrugi and icy fins of water ice". Ummm . . . I'm not sure I should tell you, Andy! Even though you're probably just asking what most men are thinking anyway, whenever they see a photo of a woman. (shaking my head) Why don't you want to know who the other three people are?? Anyway, that's Laura Rodgers, retail manager at the Whittaker Mountaineering store in your hometown of Ashford. She's a skilled ski mountaineer, and has skied Rainier from the summit via Fuhrer Finger and Tahoma Glacier Sickle -- the latter route is definitely on my "most wanted" list for 2011. Thanks, Amar.� That's what I thought!� I know Laura, of course, because the Summit House is my shop of choice for outdoor clothing (I do like the Mountain Hardwear stuff and� 1st Ascent stuff and I do live in Ashford) and Regine and I talk with Laura regularly.� But it is hard to recognize someone in bc clothing/sunglasses, etc. Of course, the hunk behind Laura, looks like Tyler Reid, renowned ski guide who is also rumored to be a friend of Laura. Nice job Amar cool report! In the month of May you probably skied Muir more times than I have since 1976! Good to see that someone keeps track of those numbers otherwise they just get lost. Born to Crunch Nuh...ahh..uhhh...uhhhmbers. Sung to Steppenwolf's song Born to be Wild. Nope, it's not Tyler -- his name is Sam, also working at Whittaker Mountaineering this winter, and it was his first time ever skinning (and only second time skiing). Apparently Laura agrees that the Muir Snowfield is a great place to introduce newcomers to our sport! 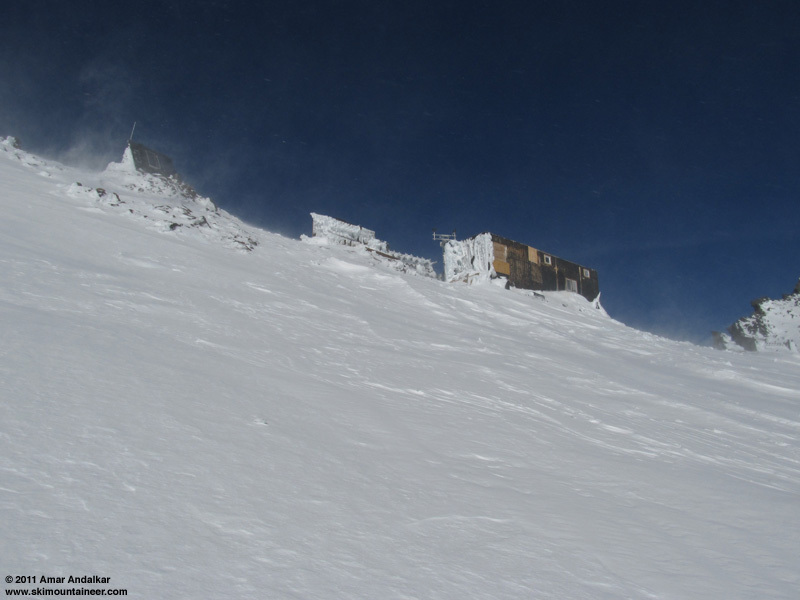 It's too bad that the unexpected crazy winds and icy skiing conditions forced them to turn around, so close to Camp Muir. And as long we're naming names, the third person in that photo (and the one breaking trail in the previous photo) is Art Freeman, an occasional TAY poster and well-known to many in the Mountaineers. I used to have the white 7XK like those -- but they delaminated underfoot after 1-2 seasons and got warranty replaced with the new bluish-purple color of 7XKs, in 1994. I still have the "new" 7XKs, although I think that I last skied them around 1998! The essence of the Cascade Range, a sublime marriage of disparate elements, the fusion of hot and cold, sun and snow, fast and slow, the alpha and omega experienced while gliding on the razor�s edge. No other route can match its combination of stunning scenery, easy accessibility, large vertical, and length of season, with skiable snow of some sort available year-round. Most importantly, it's an egalitarian route, skiable safely by almost any skier willing to learn the most basic backcountry skills, not restricted to the athletic and highly-skilled like other more serious routes which are often nominated as "best". 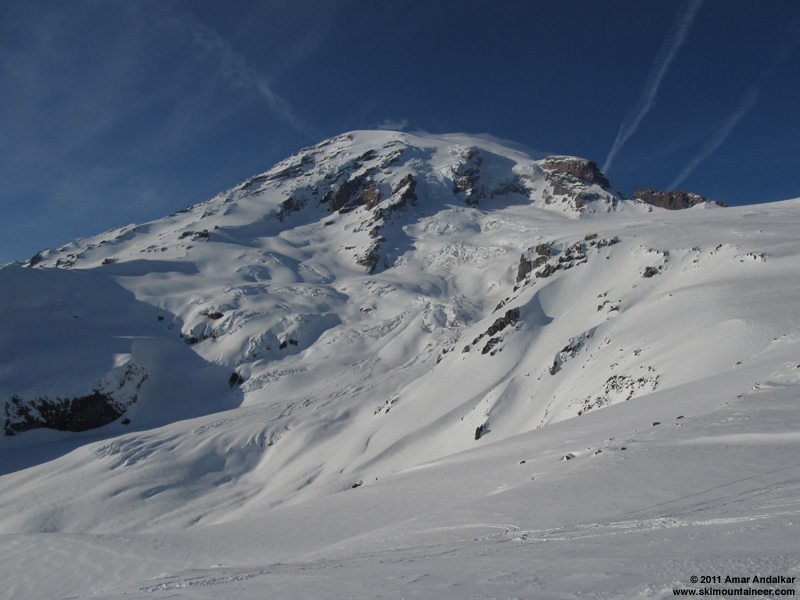 I share your deep affection for the Muir snowfield.� Thanks to your post, I better understand why.� The various essences of the place, which I had not fully articulated to myself, you have put most eloquently into words. 30,000 hits is good, but not good enough.� More people must have the opportunity to read your prose.� You need to be published!� Here's hoping that soon we can see your book on the shelves. I haven't skied the Muir snowfield nearly as much as you have, but I agree that it's one of the classic ski routes in North America. The route from Paradise to Muir has tremendous history, both happy and tragic. Congratulations Amar! I've always enjoyed your very thorough TRs and your website! When is your book coming out? Look forward to that. The Muir (my number one hero, btw) snowfield is a wonderful place. I plan to get my wife and girls up there skiing this spring or next. It's about time to give my wife the trip that will make her say, "So this is why you love to BC ski so much!" Congrats Amar!� I thoroughly enjoy your trip reports and website.� Nice work getting to 100, that's quite a feat! I've only been to the Muir once, but can see why so many people find it such a special place. No kidding about the wind today, 12 hours averaging above 100 mph, with a peak gust of 155 mph. Thanks for sharing, Amar. I really enjoyed the read. Muir was my second trip into the BC which was last February, with a few other trips throughout the remainder of the year. I really appreciate the simplicity of the climb; it's great to know that a ski mountaineer of your caliber enjoys it, too. I'm looking forward to many more trips in the future! 100 times up Muir is a milestone for sure, but is this this first histogram ever posted to Turns All Year? That might be even more of a milestone! Sorry, I'm a sucker for analytical nerdiness. Nice work. "My first backcountry ski experience, a lifetime of lift-served yo-yoing traded for a single shining run, a dream realized and a life changed forever. I had been reborn." Thanks for the great trip report Amar. I always enjoy reading your trip reports. Looking forward to reading many more. I too got hooked on backcountry skiing on Camp Muir a few years ago. I have many happy memories of the place. Now that I'm back home in Scotland, I'm using those skills and forming new 'friendships' with favourite places in the Scottish Highlands. Thanks to Camp Muir I'm finding a new appreciation for the mountains in my own back yard. The Cairngorms are a current favourite!